It feels like I’ve played a lot of word games recently, but I never quite seem to get enough of them. So, when the new releases go up each week, if I see the word ‘spell’ appear in a title, I am on top of it like a game reviewer on a bad metaphor. Generally, regardless of the other mechanics differentiating them, most of these games treat the actual spelling part the way Boggle does. You’re presented with a board of letters, and it’s up to you to find the best words you can to accomplish whatever goal you’re after. 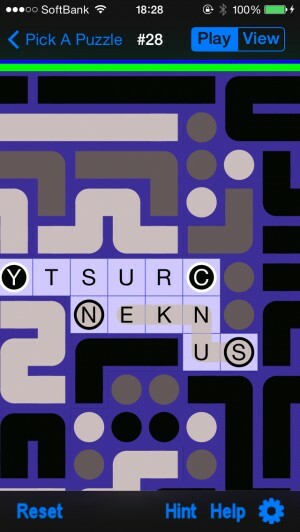 Spellpix ($1.99) might look similar at a glance, but it’s quite different, and the result is a game that feels like it has far more in common with the developer’s prior work, Pathpix ($1.99), than it does with any other word game. If you aren’t familiar with Pathpix, it’s a sort of logic puzzle game where you had to connect numbers with lines of appropriate lengths in such a way as to fill the board and create a picture. There have been several versions of the game, and if you haven’t played it before, it’s definitely worth checking any of them out. Spellpix operates on a surprisingly similar level. Instead of a board with pairs of numbers and a bunch of empty spaces, the board here is filled to the brim with letters. Most of the letters have no particular color to them, but some of them are contained within a colored circle. The goal is to form words by starting with one of those circled letters and ending with a letter of the same color. Once the board is filled up, the various colored words you’ve made will have formed a picture, and you’re onto the next puzzle. The letters aren’t random, so you’re not seeking out the words you want to spell, like in many other word games. Instead, you’re looking to use every single letter on the board to create the exact predetermined words the game intended. It’s a bit weird to wrap your head around at first, but once you do, you’ll find the early puzzles so simple that you’ll likely be a bit bored and unimpressed. As the size of the board increases, however, the difficulty skyrockets. Eventually you’ll be tangling with grids 50 or more letters across and wide, with lengthy words snaking all around. Early puzzles can be finished in a matter of a few minutes. The later ones can easily take you more than an hour. With more than 200 puzzles packed into the game, there’s plenty to chew on here. The nice thing is, you can take your time and really savor them. As in the Pathpix games, you don’t have to finish puzzles in a single sitting by any means. While filling the board is the ultimate goal, it’s very easy to work on a large puzzle one section at a time, just like a jigsaw puzzle. If you’ve only got a few minutes, you can dig out a few words and still make some progress. If you’ve got a lot of time to kill, you can slice and dice your way through all in one shot. 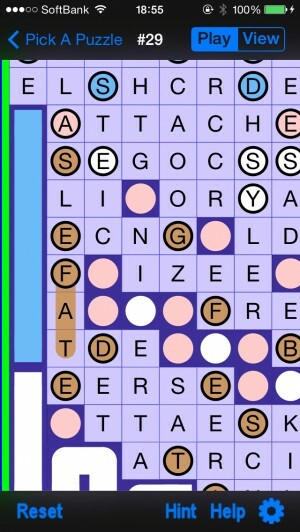 Spellpix rides the line between mellow and stimulating very well. This makes it an excellent choice when you want to play something without giving it your entire attention. One interesting way Spellpix differs from Pathpix is that the words themselves can often give you a clue to the final picture. Not every word you create has something to do with that final image, of course, but if you pay attention to the pattern that springs up, you’ll probably have a good idea as to what you’re going to end up with. In the tradition of previous games, you’ll get a little piece of text along with the picture at the end. These are quotes, insights, or even just short blurbs that tangentially connect to the picture you’ve made. They’re not all winners, but they’re a nice little extra reward for finishing a puzzle. Spellpix is certainly not a looker. Everything is clean and clear, but it’s all very utilitarian and lacking in finesse and visual polish. Sound effects are sparse, and anything resembling music even moreso. The game does have a really useful set of instructions, as well as a hint option that can help you find a word if you’re really stuck. When you finish a picture, you’ll get a list of words that you can double-tap on to read their definitions, which is a feature I generally like to see in word games. It kind of feels strange that the developer has been putting these kinds of games together for five years now without any substantial improvements in presentation, but I suppose as long as it works, it’s not really important so long as the puzzles themselves are good. Luckily, they are quite good. Spellpix manages to take most of what worked about Pathpix and give it enough of a twist to keep it from becoming just another expansion pack. At its heart, it’s not terribly different from its mothership series, so fans of those games should certainly enjoy what’s on offer here. If you’ve never played any of those games before, this is as good a place as any to dip your toes in. It’s a bit of a slow burner, but if you like logic puzzles and word games, Spellpix will provide you with hours of entertainment.